Three years ago, Persia ran away from her drug-addict parents and found a home with the Outlaws, an underground theater troupe. With time, this motley band of mortals and fey, puppeteers and actors, becomes the loving family Persia never had. And soon Persia discovers a passion for theater and also falls in love with one of the other Outlaws. Life could not be more perfect. This was an okay read for me. I really liked Persia, the main character, and most of the supporting cast as well, but the story just moved too slowly. It wasn't until partway into Chapter 12 that the Outlaws even escaped into Faerie, whereas the back cover blurb makes it sound like it happens right away. 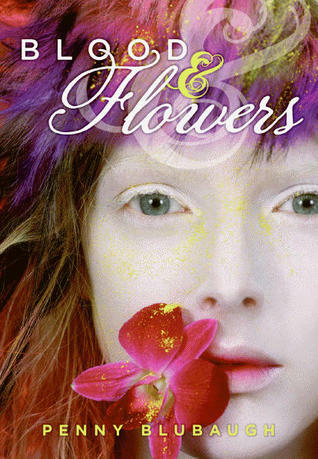 However, the overall concept of Blood & Flowers is a creative one, and readers who are looking for something new in the realm of faeries should enjoy this book. Thanks for the review on this. I was actually interested in this one because I like how creepy the cover is. I do hate it when they mention something in the synopsis when it doesn't happen until the middle or the end. I hate when that happens! That's why I prefer not to read synopii at all (I think I made up). Hmm, maybe someone else will come along that will love it? I hope someone does love it! It's an interesting and unique read - sort of like Julie Kagawa but much, much artsier. (I may have made that up too...) It's just tough to write a review when you're ambivalent about the book.